As urbanization thrives, use of a deep foundation is needed more than ever. Through piling we can make use of area that have gone unutilized. So far the piling part has been mechanized, but the piles are still often cut manually. Most common pile cutting method is still manual and that work is relatively accident prone. 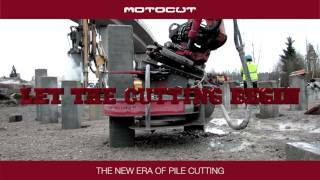 MotoCut, a Finland based company, has solved the issue by mechanizing the pile cutting. The solution is based on the experience of more than 300 000 manually cut down piles. MotoCut’s founders saw that the work could be done easier and safer, and began developing a new kind of solution to mechanize the pile cutting. The company is calling it as a new era of pile cutting. MotoCut’s innovations are new generation tools, pile cutters that can be installed to an excavator. Company came out to market in 2014 with MotoCut pile cutter for cutting concrete piles. MotoCut’s newest innovation launched at CONEXPO CON/AGG in March 2017, is a plasma cutter for cutting tubular steel piles and pipes. MotoCut states they’ve reached a new level of versality for excavators as they’ve for the first time made possible to use plasma cutter as a mobile version and it has the benefit of being able to remove the waste while working. Our mission is to make the excavator even more versatile and more cost-effective, as well as safer to use, thereby producing competitive advantage for our users, says the Founder and CEO Antti Mäkelä about MotoCut’s internationally patented solutions. While mechanized pile cutting replaces manual labor, at the same time it increases occupational safety, cuts down the working time and makes the cutting part independent of working conditions resulting accelerated construction site schedules. In terms of working with concrete piles, mechanizing pile cutting also prevents occurrence of Hand-arm Vibration Syndrome (HAVS), a major source of disability amongst the construction workers. The fairs take place Tuesday, March 7 through Saturday, March 11, 2017 at the Las Vegas Convention Center, Las Vegas, USA. You can find MotoCut’s presence inside, the Central Hall on the OilQuick USA stand C32707 and outside, the Silver Lot on the Pinnacle Drilling stand S6517. 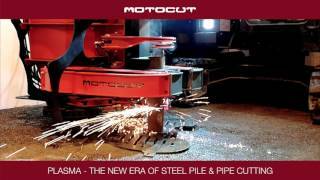 MotoCut Oy was founded in 2012, and its first product, the MotoCut pile cutter, came on the market in 2014. Since then, they’ve conquered the world, one construction site at a time, with the intention to mechanize pile cutting by increasing efficiency and improving occupational safety. MotoCut is a Finnish company specialized in the auxiliary equipment for excavators. Its mission is to make the excavator even more versatile and more cost-effective, as well as safer to use, thereby producing competitive advantage for our customers. Company has obtained two international patents, and in Finland company has won the Quality Innovation of the Year 2012 award with our MotoCut pile cutter.